The first step is to choose where you wish to go boating from our wide choice of boating areas of Europe and Canada. Second step is to choose your boat. 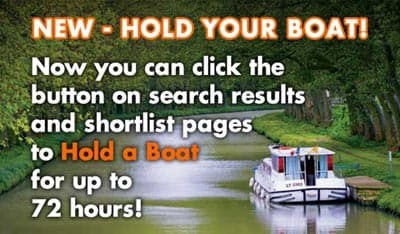 The Boats Search at the top of the page lets you find boats of the correct size which are available in your chosen boating location. Full details are shown, and the dates and routes available. Finally, for your desired boat choose the start date, and start and end base for your holiday. You may prefer an 'out-and-back' route returning you to the same base or a 'one-way trip' to another base.